Green tea is one of my top favorite ingredients when it comes to skincare. It's one of the most effective botanical ingredients, as it works to increase and retain skin moisture, smooth out skin texture, treat and improve acne, provide photoprotection, and many more benefits. Polyphenolic compounds found in Camellia sinensis (green tea leaf) are rich in antioxidants and are proven to have anti-inflammatory and anti-carcinogenic properties. It's by these polyphenols that green tea has such vital benefits. Catechins are the most abundant polyphenols in green tea, being part of the flavonoid family that are highly beneficial antioxidants and effective scavenging free radicals. There is one specific catechin found in green tea, epigallocatechin-3-gallate (EGCG), that is the most potent. It is a major antioxidant that prevents oxidative damage in healthy cells, also acting as an anti-carcinogenic and anti-tumor agent. This specific catechin is often used for its chemopreventative properties, due to it inducing apoptosis and promoting cell health. Green tea is a vital botanical with numerous benefits and treatments, and is great for many skin types! I've been lucky enough to test this 'essence oil' out for over a month now and I can truly say that so far no Innisfree product has ever let me down, this included! 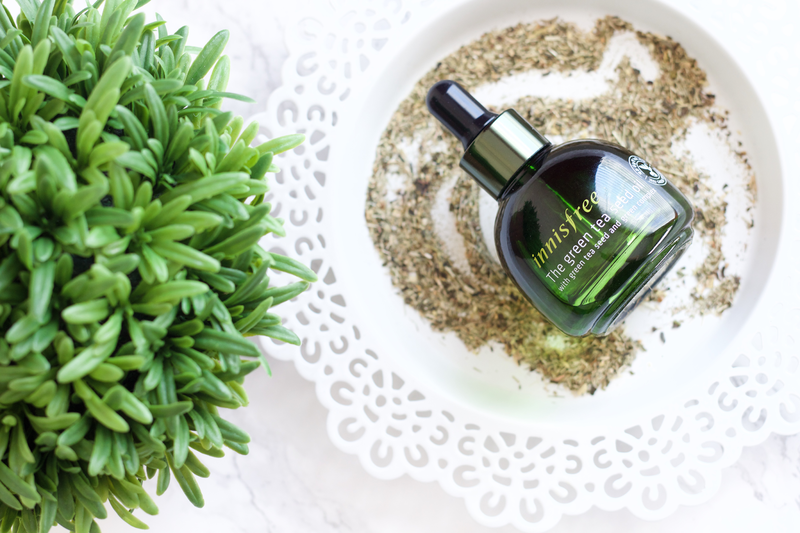 If you are not familiar with Innisfree (이니스프리), they are an eco-friendly South Korean skincare brand that prides itself on using natural botanicals sourced from Jeju Island (Jejudo/제주도). They describe themselves as "a natural brand that shares the benefits of nature from the pristine island of Jeju" with an "eco-friendly green life to preserve the balance of nature." Mt. Halla (한라산), a shield volcano on Jejudo, offers many rich antioxidants from flora and fauna. Innisfree is especially known for their chemical-free green tea farming fields, which are located on the hillsides of Mt. Halla in Seogwipo, and their multiple product lines using green tea extract. Innisfree actually has a flagship store on Jejudo, called Jeju House/이니스프리 제주하우스 (located in Seogwipo), next to O'sulloc Tea Museum and tea fields. It operates as a retail space and organic cafe selling food and desert sourced from Jejudo. There are fun activities to do there, such as making your own soap using Jejudo sourced ingredients, too. You can also pick out ingredients to DIY your own mask, which I think is just brilliant! They have another Jeju House space on the mainland, located in Samcheongdong (삼청동) in Seoul. Innisfree was the first natural South Korean skincare brand to be established on the Korean market, and since then they have created multiple skincare lines and a makeup line, too. They have some major cult products that are very much used in the Asian Beauty world, such as their Volcanic Pore Clay Mask, Green Tea Seed Serum, and No Sebum Mineral Powder/Compact. I have both the Volcanic Clay Mask and Green Tea Seed Serum and I really recommend you trying them out! 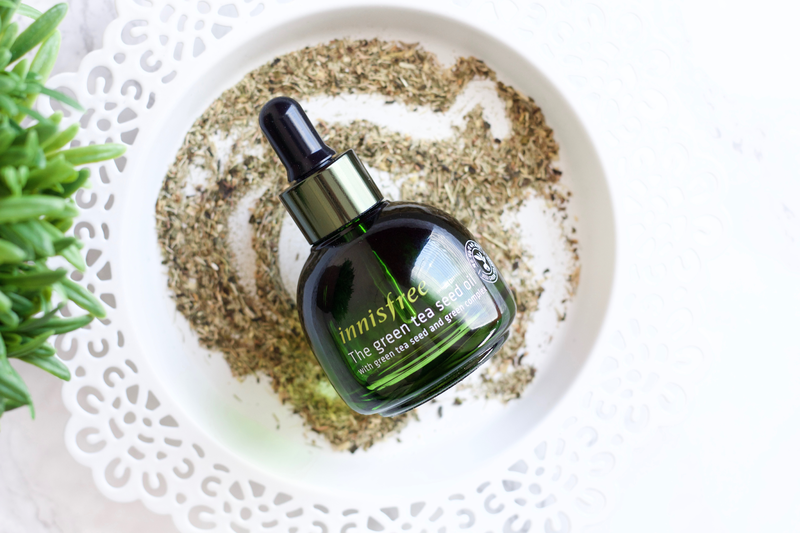 Innisfree's green tea lines are nourishing and great for treating skin conditions. They split up the green tea lines based on skin type: Green Tea Fresh (oily skin), Green Tea Balancing (combination skin), and Green Tea Moisture (dry skin). I have used a couple products from their Green Tea Fresh line, including their Green Tea Fresh Skin and Green Tea Fresh Essence. Green Tea Fresh Skin is honestly one of my favorite toners of life, if not my favorite. It is so hydrating and refreshing! I have to stock up for the colder days that are coming, it's most likely going to be my top toner to use as my skin gets drier and its soothing properties are exactly what I will need. As I mentioned before, Innisfree is an eco/green brand. They have an active recycling campaign, by which you can return used product packaging after it's finished and they will recycle it. They also use eco-friendly containers. 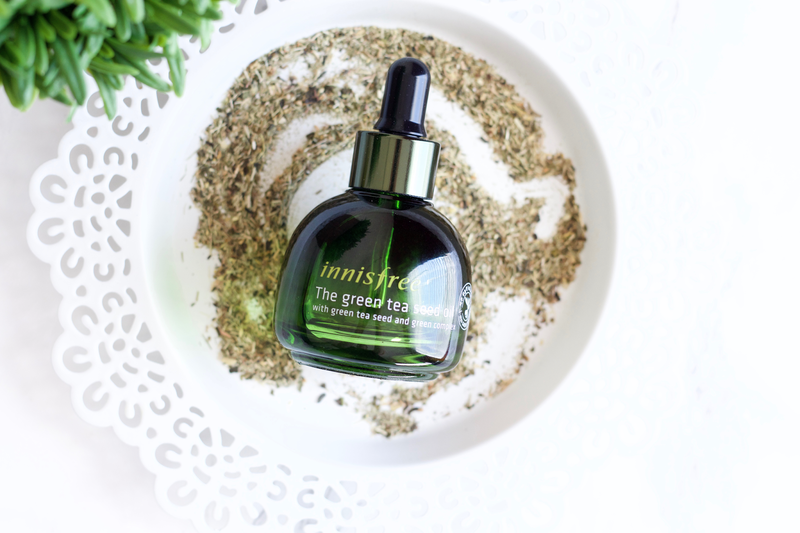 Innisfree Green Tea Seed Oil* is a lush, natural green tea-based essence oil that deeply hydrates and nourishes the skin. It is made with 151 (!!!) green tea seeds from Jejudo and includes green tea extract and leaf extract. 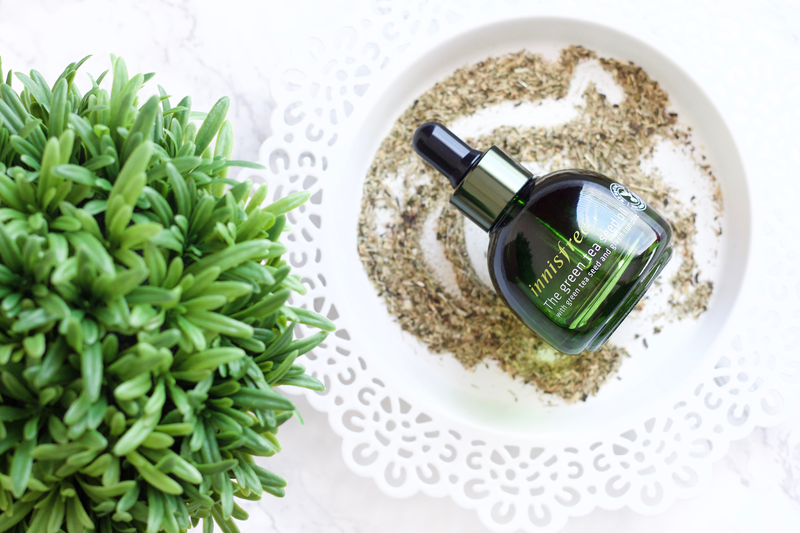 This oil has effective antioxidant properties from the inclusion of green tea seed and leaf extract's polyphenol contents, along with Vitamin E and amino acid content restoring skin's moisture. This oil especially is targeted to control oil while providing an abundant amount of moisture to the skin. This product is part of their green tea seed line, which has special moisturizing and nourishing skin benefits. Also included in the green tea seed line is their Green Tea Seed Cream, Green Tea Seed Eye Cream, Green Tea Seed Deep Cream, and Green Tea Seed Serum. I am in love with this oil. It has a lovely floral scent that is so refreshing, which makes applying it such a relaxing activity. It is light on the skin and instantly provides buckets of moisture. You only need the smallest amount, about 2-2.5 drops is usually what I like to use, as it can get a bit heavy and oily if you add too much of it (it can't absorb very well if you use too much!). The best thing about this oil is that it gives me so much hydration that I usually can just skip my essence step most times. It absorbs really quickly so you won't be waiting very long if you're putting this on before bed. I like to use this only at night as I wake up the next morning with such revitalized and hydrated skin. It makes my skin very soft and I notice that my natural oils are lessened with consistent usage of this. What I like the most about this is that it has a very watery texture, so afterwards it doesn't feel oily (if applying right amount) or have any other kind of residue. I love using this to finalize my routine! Korean skincare focuses a lot on 'patting' products into the skin, so I usually do that with this oil and I find that it absorbs better that way (rather than rubbing it in). I've found a great video from NYLON TV KOREA which shows the oil being applied (patting motion! ), and the model's face was not only beautiful before but looks so healthy and glowing afterwards. This is definitely going to be my oil for the upcoming cold days, as it's already done so much for me even with it being hot weather. I love that it also adds a nice glow to my face and doesn't clog my pores. 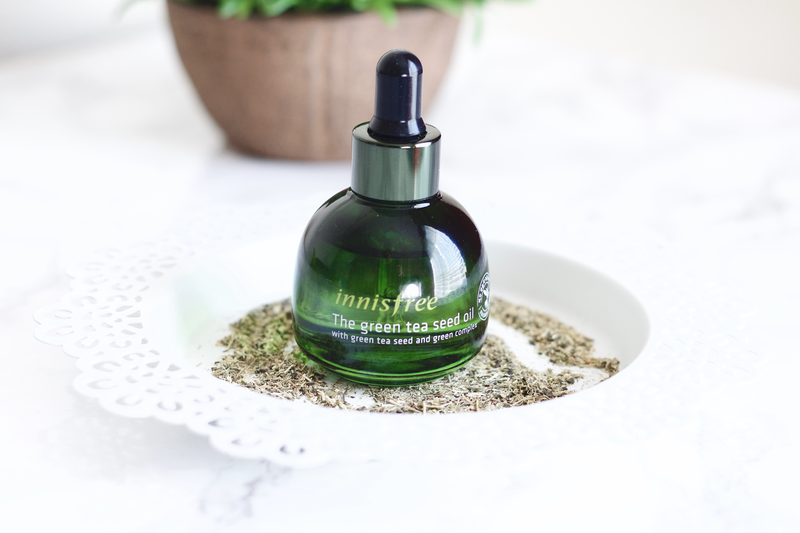 Just a beautiful oil that I really treasure, and I'm not surprised I love it so much since Innisfree's products have been so nourishing for my skin! Not only does this oil have green tea sourced variations (seed oil, extract, and camellia leaf extract), but it also includes other lush botanical sources like sunflower oil, citrus peel extract, prickly pear extract, and orchid extract. Pricky pear extract has brightening properties, which I have not exactly seen brightening but my skin has gotten a nice glow from using this oil. Orchid extract is what really got me excited, as I love Innisfree's orchid anti-aging line since it has such great moisturizing and skin conditioning benefits. I have gone through a tub of their Orchid Gel Cream and love to use it during winter. Sucrose Polycottonseedate is plant-based fatty acid that works as an emollient and skin conditioning ingredient; it is a mix of cottonseed acid and sucrose, a natural sugar. Citrus Peel Extract is part of the flavanoid family, which makes it a great cancer fighting and antimicrobial ingredient. I'm really impressed that they included such valuable ingreidents along with the green tea, it really makes all the difference and is why this oil is such a diamond. *Innisfree uses plant-sourced Squalene from Phytosqualane, it has been confirmed by them. Another Innisfree product that I absolutely love! I'm starting to doubt if Innisfree will ever make a green tea product that I dislike. If you have yet to try this oil, I really recommend picking it up, especially as we are already into Fall and soon into Winter. You buy this at Miibox here! Have you tried any products from Innisfree? If not, what are your favorite oil products to use? *This product has been kindly gifted by Miibox. See my disclaimer for more information.